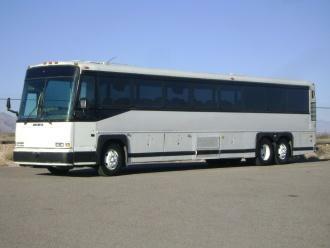 This is one of several MCI 102DL3’s that we just got in! Over head it has enclosed parcel racks and parcel rack A/C units. There are 5 video monitors as well as an AM/FM CD player. It is powered by a Detroit Diesel 12.7 liter Series 60 engine that has tons of power. The transmission is a robust Allison six speed automatic. This would be a great bus for a sports team, employee hauler, or use it for any job where you just need to move a bunch of people! This is one tough work horse that can get the job done! A/C & Heat: Driver and Passenger A/C and Heat plus Parcel Rack A/C!